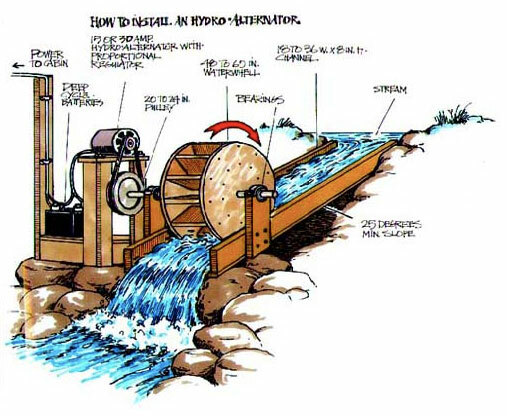 On March 9 the town of Carbondale notified the Federal Energy Regulatory Commission it plans to install a micro hydropower turbine in a pipe leading to its municipal water treatment plant on Nettle Creek. On March 13 FERC found that Carbondale’s project qualified for a quick review under the Hydropower Regulatory Efficiency Act of 2013, which streamlined the permitting process for hydro projects of less than 5 megawatts. And by April 27, if no one claims the project doesn’t qualify, the town can expect to get a letter from FERC saying the town does not need a license and can go ahead, at least as far is FERC is concerned. At 28 kilowatts, Carbondale’s project is much smaller than the 5-megawatt limit in the efficiency act, it’s a new license using a nonfederal pipeline, and it complies with the Federal Power Act. So far, FERC’s fine with it, and it’s received no objections from the public. The pipe is 1,800 feet long and transports about 1 cubic foot per second of water downhill from Nettle Creek to the city’s treatment plant. The plant is eight miles up the Crystal River valley on the lower slope of Mount Sopris. The turbine would be built inside a vault installed in the pipeline, near the treatment plant. A short bypass system would allow water to be moved around the turbine for repairs and maintenance. O’Meara also said that since it’s a nonconsumptive use of water already running down a pipeline, the town did not have to change its existing municipal water rights to specifically add hydro as a use. The turbine’s “installed capacity” of 28 kilowatts and its “estimated annual generating capacity” of 190,000 kilowatt-hours is about enough electricity to offset the amount of power used to run the water plant, O’Meara said. According to Craig Cano, a media relations officer at FERC, the 28 kilowatt figure refers to how much power the turbine could produce at any moment. “That’s real small,” Cano said, pointing out it’s 0.028 of a megawatt, while a typical baseload-generating power plant’s capacity is in the hundreds of megawatts. The 190,000 kilowatt-hour figure refers to the total amount of energy produced over a year. The resulting electricity would either be sent through the existing Holy Cross Energy system that today powers the plant, or perhaps be used directly in the plant, O’Meara said. The town would get credit from Holy Cross for hydropower sent out over the grid. The project has been in the works since the 1990s, but it still has a long way to go. On the list is an in-depth feasibility study considering design, engineering and cost. A 2012 estimate from engineering firm SGM put the cost at $180,000. O’Meara did not have an updated cost. And since the water plant and pipeline are on U.S. Forest Service land, the agency also has jurisdiction over the project. But O’Meara said after going to a recent workshop put on by the Colorado Energy Office, it seemed like the right time for the town to enter the streamlined FERC process and see how it goes. It took only four days after receiving Carbondale’s “notice of intent” for FERC to issue its “notice of preliminary determination” that the project qualified for speedy review. That notice, along with town’s initial notice, are on town’s website, on its utilities page. Also on March 13, FERC opened two windows for parties to contest the qualifications of the project. The first was a 30-day window to file a motion to intervene. By April 12, no one had. The second was a 45-day window for less formal but still “contesting” comments to be made. That window closes April 27, and as of April 13, FERC had received no comments. If someone does file a comment contesting the project’s qualifications, FERC is supposed to then “promptly issue a written determination as to whether the facility meets the criteria,” Cano said. Carbondale’s O’Meara said that as far as he knows, no one over the years has raised concerns about the project directly to the town. Aspen Journalism is collaborating with the Post Independent, The Aspen Times, the Vail Daily and the Summit Daily News on coverage of water in the upper Colorado River basin. More at http://www.aspenjournalism.org.